These carrot cake muffins have a cream cheese filling and are gluten-free and grain-free with a great texture! Nobody will know that these are gluten-free. After I posted these paleo carrot cake cupcakes two years ago, I knew I had to de-paleofy them by adding a cheesecake filling. I’ve tried a number of fillings and they all had their issues. They were too runny, used weird proportions like 1/2 egg, or made the muffins soggy. Finally I came up with a winner! The filling is so simple it’s almost frustrating. Why couldn’t I have tried that to begin with?! The muffins really have an awesome texture. They’re super moist and somehow even kind of fluffy, which I haven’t experienced too much in grain-free recipes. Check out the reviews in the original recipe if you need convincing. Everyone seems to love them! 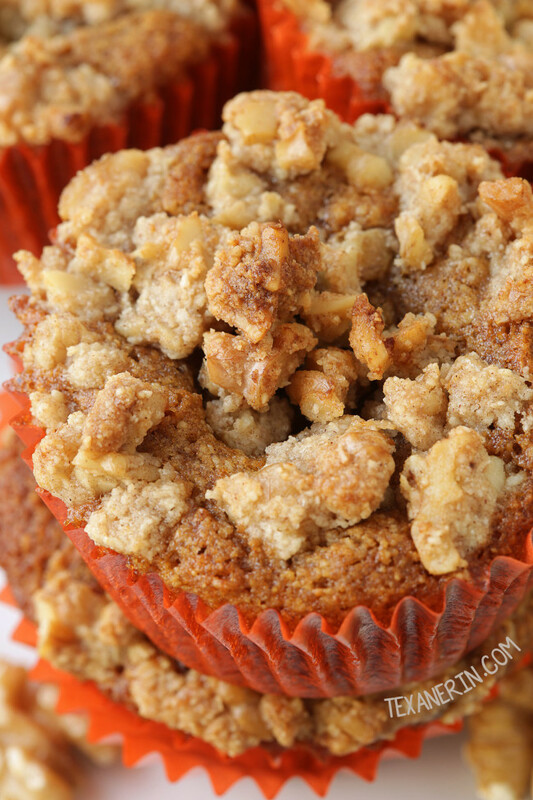 I added a walnut-based streusel topping but to be honest, we preferred the muffins without. I thought that it somehow interfered with the creamy cheesecake filling. But I’ve included the streusel recipe in the notes section should you want to try it out, anyway! If you do, I recommend chopping the walnuts finer than what you see in the pictures. My chunks were so large that the topping kind of fell apart when you ate it. These are definitely some of my favorite muffins ever. Gluten-free or not. I love them without the filling but add cream cheese filling to anything and it just instantly becomes so much more delicious. If you need something dairy-free, try these gluten-free carrot cake baked donuts from Food Faith Fitness! They look amazing. Or you could make the carrot cake muffin part and add this vegan cream cheese frosting on top. It’s great stuff! And there’s no processed vegan cream cheese with funky ingredients in there. Preheat the oven to 350°F (175°C). Line a muffin tin with 10 muffin liners. Prepare the filling. In a medium bowl using an electric hand mixer, beat all filling ingredients at medium speed until light and fluffy. Set aside. Prepare the muffin batter. In a medium mixing bowl, mix together the dry ingredients (almond flour through nutmeg). Set aside. In a large mixing bowl, mix together the eggs, oil, honey, and vanilla extract. Add the dry mix to the wet mix, stirring just until combined, and then gently fold in the grated carrots. Pour a little batter into each cup so that they're about 1/5 or 1/4 full. Add about 1 tablespoon of cheesecake filling and then top with the remaining muffin batter. Bake for 20 minutes or until a toothpick inserted in the side of a muffin comes out clean. Let the muffins cool for 5 minutes in the pan and then remove to a wire rack to cool completely. Refrigerate in an airtight container for up to 3 days. Please read the post above regarding my thoughts on this topping. If you want to use it anyway, here's what I used. You just mix it all together and sprinkle over the batter before baking. 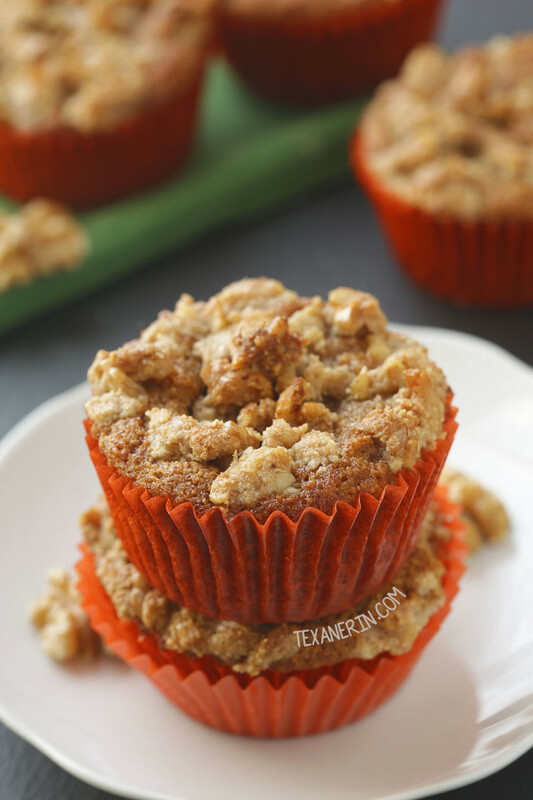 62 comments on “Carrot Cake Cream Cheese Muffins (grain-free, gluten-free)” — Add one! Delicious….Just made these and had to try one once they cooled a bit. I made 8 muffins and maybe too much (haha) creamed cheese filling but oh so good. Thank-you! You’re welcome! I’m so happy that you enjoyed them. :) Thanks for your comment! These look great. I am going to make them today. How many carbs in one muffin? I’m sorry for just now seeing your question! I live in Germany and am legally not allowed to post nutritional information on my blog. Sorry I can’t be more helpful! Hello! I cannot wait to try these muffins! Do you have a nutritional values for one muffin/serving please! Thank you! Sorry for the slow reply! Have been in the hospital giving birth. :) I unfortunately don’t have those values. You could always enter them on Caloriecount! I’d give you the link but I’m on my phone making it difficult. These came out great! I’ve been craving carrot cake lately, but with it being just my boyfriend and I, getting a whole cake is out of the question. I served them with breakfast as a treat and after one bite he commented on how they were really good. I made 8 muffins, not 10. They didn’t rise over the baking tin either, they came out to be average cupcake size. I just sprinkled some crushed walnuts on top and a little Stevia for presentation, and had frosting leftover so added a dollop to the top of each. Would make again! I have coconut flour, but my son is allergic to almonds. Do you know a substitution that might work for the almond flour? Thank you! Unfortunately, nuts flours aren’t interchangeable with non-nut flours. I’ve heard of people using sunflower seed flour as a sub but I’ve never tried it and have no idea if it’d work here. Sorry about that! I successfully made them with homemade hazelnut flour (my son is not allergic to all tree nuts, just almonds/pistachios/cashews). Great recipe, thanks! Great to know! Thanks for the tip. :) I’m happy they came out well! I’d love to make these but have the Pillsbury gluten free flour that can be used cup for cup instead of regular flour. Any idea on how much I’d use for this instead of the separated flours? Please see the comment below yours. :) It’s also valid for GF all-purpose flour. Hope you’ll enjoy them! I have a B & B and would like to use regular flour…do you think I can? That unfortunately definitely wouldn’t work but I have a delicious alternative! You can use AP flour in this recipe (although it says whole wheat, all-purpose flour works, too!). It’d yield 24 cupcakes (so you’d need more cream cheese filling). Bake at 350F for 14-18 minutes if you want to make them without the filling or if you want the cream cheese filling, you’ll probably have to bake them a little longer. Are you sure its 1/4 tsp nutmeg and not 1/8? I’ve made your carrot cake muffins (the ones without the cream cheese filling) and the first time I made them I didn’t change the recipe. But the nutmeg flavor was so strong! So the next time I made them, I used only 1/8 tsp. They were much better. Nutmeg can be very overpowering, so I’m confused why the recipe says 1/4 tsp. But I’ll be sure to try these with the cream cheese filling! They look delicious! Thanks! I hope you’ll enjoy these, too. And I’m sure it’s 1/4 teaspoon. :) I’ve made these and the original carrot cake muffins without cream cheese filling and always use 1/4 teaspoon. I’ve gotten tons of feedback reviews on that recipe but this is only the second time anyone’s said that there’s too much nutmeg. I use pre-ground nutmeg and perhaps you’re using fresh? But even if that were the case, I’d expect a lot more comments about it being too overpowering (assuming that lots of other people grate it fresh :)) Perhaps it’s just a matter of taste? Yes, perhaps so. I’m glad it’s just me and not a typo! I made them yesterday with a little less nutmeg and used coconut nectar in place of honey. Also used coconut nectar in place of sugar in filling. SO yummy! My family and I really enjoyed them. I’ll continue to search for more grain-free recipes! Hi Erin, does this recipe double or triple easily? I’m kinda iffy about doubling the baking soda. Please let me know as I wanted to bake the jumbo ones tonight. I’m sorry for my slow reply! I live in Germany so I had already gone to bed by the time your comment came in. I haven’t tried tripling it but I’m pretty sure that doubling it work. I hope you’ll enjoy them! There’s not a direct sub for coconut flour as it absorbs so much more liquid than any other flour. If you feel like experimenting, you could try this but I’m not too hopeful that it’d work well in these muffins. Sorry about that! Haha. Yeah. I was a little confused at first. ;) But good to know that you enjoyed the coconut sugar filling version! Saw these on Pinterest today and immediately knew I had to make them. Stopped by the store on my way home to get almond flour (only thing missing from my cabinet) and got to baking! They were moist, delicious and super easy to whip up! Carrot cake is my all time favorite and this is by far the best grain free version I’ve come across! The cream cheese filling was perfect too (I used coconut flour). I will certainly be making these again and have started following you! I LOVE your grain free recipes. Thank you so much for sharing this!! OMGosh do I ever wish I could grab one of those right from my screen this very second! 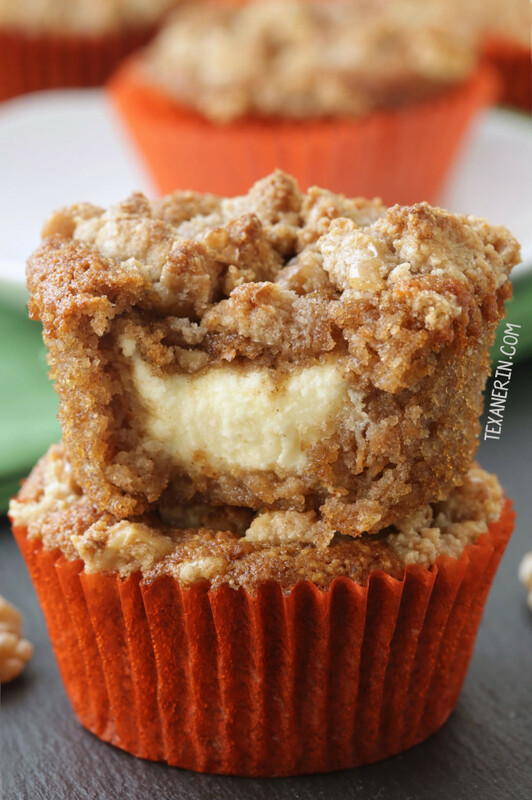 They look SO good!O like the streusel topping, but would go right for the cream cheese first! Mmmm! I absolutely love carrot cake and your creation looks simply divine. I wouldn’t mind waking up early if this was for breakfast. Can’t wait to try it thanks for sharing! I don’t think I have ever seen grain free look so tasty! They are so moist I just want to gobble them all up! I can’t resist carrot cake baked goods! Love the cheesecake filling! Carrot cake for breakfast is a great idea! And what a smart internet tip, I never knew that! I love when muffins and cupcakes have hidden centers. I feel like I would have a hard time just eating one of these muffins they look so good. I know you said the streusel topping was optional but I like to think streusel is never optional…haha. I LOVE these muffins! The carrot cake/cheesecake combo sounds amazing….especially if I can have it for breakfast! Oh wow, that cream cheese filling is calling out to me! These look incredible! These look incredible! We’re on vacation right now and I’m absolutely trying these as soon as we get back home! These do look moist. I like carrot cake too. I tried to leave a comment on your page with the GF Paleo double chocolate cookies. I made them today. They were good still warm from the oven. HA!! I used coconut oil that has a coconut taste and all I had was sunflower seed butter. I reckon it worked though. They were very thick. Didn’t spread at all. I was shocked. Carrot cake for breakfast? Count me in! Love that cream cheese filling in the center. I have a secret obsession with carrot cake. Love that these are so good for you!